The woman was taken to the hospital and is currently in stable condition. A teacher was hit by lighting while working bus duty outside an Ocean County, New Jersey school. The strike happened during a threat of thundersnow. UPDATE: The superintendent of Manchester Schools has identified the teacher and says she is recovering at home. A teacher was struck by lightning outside an Ocean County, New Jersey middle school during a rare weather phenomenon known as thundersnow. The 33-year-old woman is an 8th grade teacher at Manchester Middle School in Manchester Township. She was tending to bus duty outside the school's building on Ridgeway Road around 2:30 p.m. as the school was preparing for dismissal when the umbrella she was holding was struck by lightning, Manchester Township Police said. She was standing on the sidewalk in front of the school with other staff members when the strike occurred. The teacher, who was alert and conscious, was first taken to the school nurse's office. She said she felt a tingling in her hand and arm and was taken to the Jersey Shore Medical Center in Neptune, New Jersey where she was treated for non-life-threatening injuries, according to police. 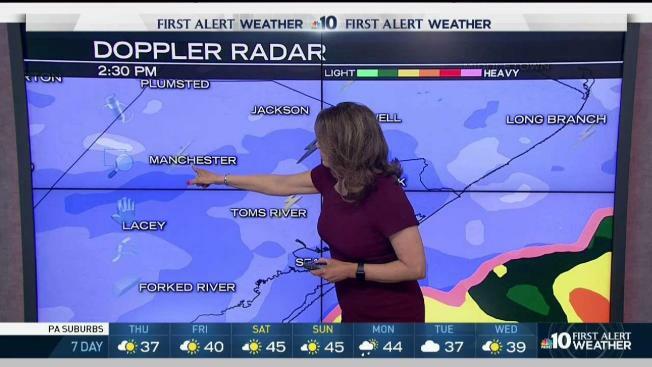 There were reports of thundersnow in Manchester Township around the same time the lightning struck, according to NBC10 First Alert Weather chief meteorologist Tammie Souza. There were more than 30 reports of lightning strikes across the region as a major March nor'easter battered towns in Pennsylvania, New Jersey and Delaware on Wednesday. Tammie describes thundersnow as a "thunderstorm in winter conditions." "Instead of a quick burst of heavy rain that you would get, you get a quick burst of extremely heavy snow — maybe 2 or 3 inches an hour," she said. "You get the lightning, you get the thunder and you might get some gusty winds." During Wednesday's nor'easter, there were reports of thundersnow in several South Jersey counties.